Fun performance shouldn't be optional, and in the driver's seat of an RLX it isn't. With precision handling and a 310-horsepower V-6 engine, performance is built-in. But driving enthusiasts aren't the only shoppers who will get a kick out of it. The 2015 Acura RLX in Arlington does several things right. Among midsize luxury sedans, it stands out as one of the best options for shoppers who want lots of high-end features for a competitive price and a comfortable and roomy interior akin to that of a large sedan. Whether you're a tech guru or not, you'll be thoroughly pleased with RLX's smart features. 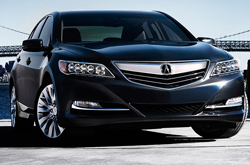 For a price that's often less than that of competitors, 2015 Acura RLX reviews say you'll get an abundance of gadgets. At the entry level of the RLX series, features include a rearview camera, Bluetooth phone/audio, tri-zone automatic climate control, HD and SiriusXM Satellite Radio, and smartphone integration that'll allow you to access apps and other mobile device features through your car's dashboard. Several available equipment groups add even more features to the pot. For instance, the RLX with Navigation gains AcuraLink telematics and turn-by-turn nav, while the RLX with Technology gets a blind-spot monitoring system, and the Advance package tacks on front and rear parking sensors, heated rear seats and other amenities. When you come see the 2015 Acura RLX in Arlington, you can also choose between gas and hybrid variants. The gas-powered sedan is outfitted with a 3.5-liter V-6 engine that produces 310 horsepower and 272 lb.-ft. of torque, while the Acura RLX Sport Hybrid combines the V-6 with three powerful electric motors. Also, if you'll be shopping for a hybrid variant, please note that Acura has decided to carryover the Sport Hybrid under the 2014-model-year designation, instead of 2015, throughout the new year. 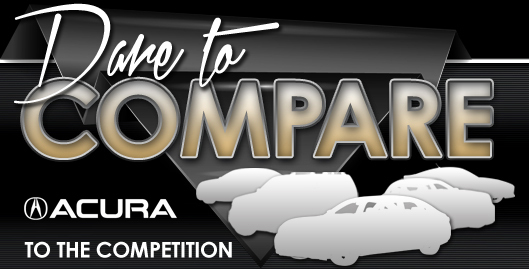 See the remainder of our 2015 Acura RLX review below and try out our Dare to Compare tool to see how RLX measures up against other midsize luxury sedans. Compare Acura's latest model of the RLX to its rivals and we're more than confident that you'll choose it over vehicles like the 2015 Mercedes-Benz E-Class, Volvo S80 and the Lincoln MKS. Shoppers will benefit from the RLX's cut-rate sticker price, as well as its splendid styling. You'll certainly see it's a fabulous value when you compare its price to competing vehicles. Find out more - Look through the bullets under this paragraph! 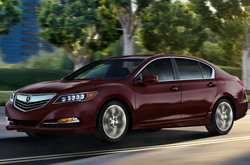 Do you want to know more about the 2015 Acura RLX's features and specs? After reading the review above, visit Vandergriff Acura and experience the RLX up close. We are a premier Acura dealer in Arlington, and it's our responsibility to serve you with reviews drafted by some of the most knowledgeable automotive writers in the industry. Filled with beneficial facts and specs, including safety features and other info, each overview gives you full access to everything Acura's lineup has to offer. Now that you've checked out Vandergriff Acura's RLX review, please phone us to make an appointment for a test drive or learn about exclusive dealership offers and deals from the OEM.